Speedskating’s all-time middle-distance king has nothing left to prove: Two-time Olympic Champion, 10-time World Champion, World Record Holder at two distances for going on a decade. So what could possibly be Shani Davis’ motivation for a fifth Olympics? Hint: It’s the same as it was for the first in 2002 – Pursuit of Excellence. An early-season personal best at 3000 meters – his first PB since 2009 – and an injury-free summer and fall give Davis reason for optimism. An older, wiser Shani may be at peace with not standing atop the podium as frequently – his last international victory was the 2015 World 1000m Championship – and he knows that his margin for error is thinner than ever, but many – most – of his memorable victories have been by razor-thin margins. Even last winter, despite a relative drought in his annual World Cup medal harvest, Shani came within just .2 of his 59th career individual World Cup win, and he managed to reach the podium on two occasions. And while he won’t be the Olympic favorite this time around, Shani knows that underdogs frequently prevail at the unique Olympic competition. He need only recall the 2010 Games when an accomplished veteran Dutch skater named Mark Tuitert upset the heavy favorites to take 1500m gold. SD.org: What is your mantra, if any, for this final Olympic season? SD: I have a hard time answering this question. As always, I just try to keep it simple and not put too much pressure or unrealistic expectations on myself. Along this journey of mine I have acquired so much information and knowledge, wisdom, that I just want to use to the best of my abilities and see what happens. Mistakes were made in the past and I face new and different challenges and competitors now, but I’m still in control of my destiny and I’m fully responsible for making sure I get to where I need to go, to be the best possible skater, the best possible person, I can be. If along the way I know I did my best then I’m satisfied. SD.org: How will you define success this season? SD: First, success will be qualifying a position in the distances I want to skate at the Olympics, 1000m and 1500m. After that, success will take the form of arriving to the Olympics healthy and without hindrances or distractions. Finally, success will be going to the Olympic start line confident and happy in the training and the choices I made during the preparation process, without fear or doubt, pushing myself to the edge of physical and mental performance, and spreading my wings and just flying. All I want is the opportunity to do my best. If I can do this, my last season would be my most successful yet, win or not. SD.org: This year has seen the passing of two coaches who were instrumental in your development: Saunders Hicks and Bobby Fenn. Can you speak to the influence of these men in your life? Does their passing give any added emotional or spiritual meaning to your final Olympic season? SD: Sanders made everything possible for me. He is really the coach most responsible for where I am now. If it wasn’t for him I would have never begun skating. He built up the club I began my journey with, he pointed the way, and he’s always been along for the ride as my career unfolded, from taking me to run up the Mount Trashmore hill in Evanston, to getting me access to various health clubs so I could train for competition. Sanders was truly there for every step of the way, from winning my first local races around Chicagoland, to becoming a national champion, making junior and senior world teams, becoming world champion, Olympic champion. I am so grateful that he was able to share in my legacy and enjoy in the fruits of my success. Before all the glory, he was there. Coach Bobby will be greatly missed. I’m happy and proud that I had the opportunity to work with him and that he was able to fill me with wisdom from all of his experiences and expertise, the things he’s been through in his life, on the ice and off. We had a wonderful friendship and I always knew as long as he was around he would always be supportive and have my back if I needed somebody. He appeared in my life when I really needed an ally, someone who could help me balance all of the things I couldn’t handle by myself at the time. I recently had a dream about Coach Bobby and he was coaching me just like old times. I was happy he paid me a visit; it gave reinsurance that, even though at the time I was struggling with my skating and was doubtful and fearful, if I continued to work it out and believe in the ultimate goal I’d be okay. And for as long as I live Sam and Bobby will be with me in soul and spirit. They may not be here physically, but spiritually they will be with me all season long, and I will always pass along the life lessons they have shared with me. SD.org: It’s February 25 and the Olympic Closing Ceremony just ended. 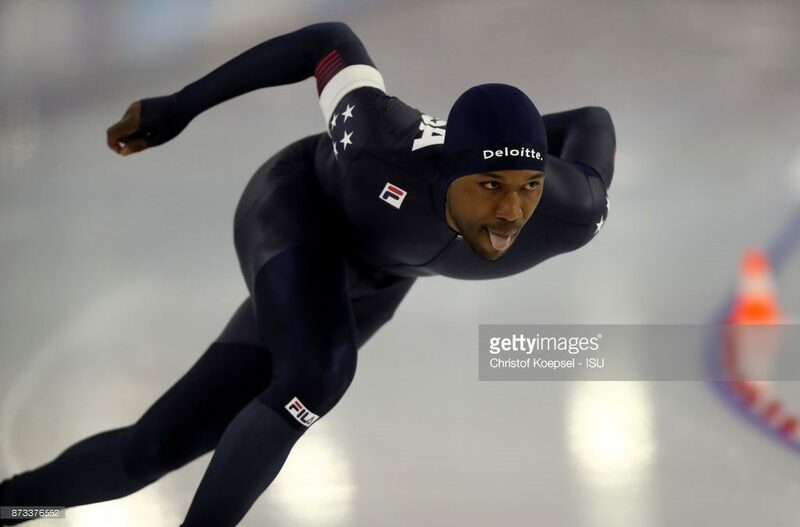 Shani Davis is preparing to…? SD: …Finish up the season and enjoy the precious moment that skating has allowed me to have. Once it’s over, I’ll simply put down the skates and rest my mind, soul and body. After that, I’ll figure out the next steps and challenges in my life, however the wind is blowing. SD.org: Any other shout-outs or thoughts you want to share? SD: Yes, to the people who stay true and keep believing in their dreams even though they seem far way: Never ever give up the fight and stay focused only on the task at hand. I’m thankful that so many people around the world have tuned into and supported my journey.